I have not purchased a loaf of bread (except for a day old ciabatta to make croutons) in three weeks. It's taken me about 2 months of reading and practice, but I can now produce all the bread I need for a week over the weekend. When I decided I wanted to start baking my own bread, this was my only real goal. Now that I've been baking bread though, I must say it's become quite an addictive hobby, and the desire to turn out better and better loaves seems to haunt me lately on a daily basis. The really amazing thing I've learned so far about baking bread is that the most minute changes in ingredients or techniques can have major effects on the finished loaf. It is because of this fact that almost endless experimentation is possible. I can see myself baking the same recipe 20 times in a row, every time changing some little nuance just to try and get the bread to be all it can be. My bread baking breaks down into 2 basic categories. First, are what I've been referring to as sandwich breads, of which oatmeal bread would be a good example. These breads are usually enriched, deriving some of their flavors from additions like honey or butter, and are baked in loaf pans. Second, are artisanal breads, of which ciabatta would be a good example. Artisanal bread baking basically refers to the idea that the breads are hand crafted, and elevates bread baking almost to an art form. These breads are usually baked on the floor of a stone oven, or stone tiles in a home oven. 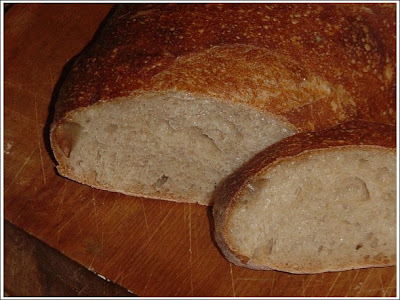 They typically feature beautiful crusts, a somewhat open, airy, crumb, and derive their flavor from sugars that are the result of fermentation by yeast and bacteria, and from enzyme action. This process takes time, so artisan loaves can't be made extremely quickly. Most involve some type of starter, a long fermentation period, or a combination of both in order to maximize flavor. My early attempts at artisanal style baking were focused on ciabatta, with mixed results. I definitely need to keep experimenting (and I will). Last week though I decided to try a recipe I found on The Fresh Loaf website for something called rustic bread. The results were my first loaves that I was truly proud of. They looked beautiful and tasted even better. So of course I have a batch in the oven right now as I write this to see if I could repeat my success or if maybe I just got lucky that first time. I'll let you know how it turns out at the end of the post. The recipe starts the day before you want to bake the bread with a starter. Mix the bread flour and salt, and stir the yeast into the water. Add the yeast/water mixture to the flour and stir until all the flour is hydrated. Add a little water if there is still flour on the bottom and sides of the bowl. Cover the starter with plastic wrap and leave it out overnight (up to 16 hours, then refrigerate if you're not ready to continue). The next day make the main dough by mixing bread flour, whole wheat flour, salt, yeast, and more water until all the ingredients are hydrated. Dump the starter onto a board and chop it into a bunch of tiny pieces, if it sticks to the board a bit, use your bench scraper, but resist the urge to add extra flour (so far in my limited experience, erring on the slightly wetter side of things makes for better bread). Add the chopped up starter to the main dough and knead by hand for about 10 minutes or with the dough hook of your mixer for about 5 minutes. Again, this dough is pretty wet (which is referred to in bread baking as "slack dough") and can be hard to knead by hand, but try not to add too much flour. Put your dough into an oiled bowl and allow it to ferment for 2 1/2 hours. I turn the thermostat in my house up to 70 degrees when I'm fermenting but if it's cooler in your house you might need to let it go a bit longer. According to Peter Reinhart, fermentation time doubles with every 17 degree Fahrenheit decrease (and halves with an equivalent increase). So adjust your fermentation time according to the temperature in your house. After 60 minutes, lightly punch down your dough and flatten it into a large rectangle. The dough is then folded which helps the gluten to develop. Folding is a great technique for working with slack doughs since they are hard to knead due to their high water content (very sticky). By the end of the second folding, you should be able to feel the development of the dough (it will feel stretchy) and be much easier to handle when its time for shaping. Cut the dough into two even pieces (I'm still getting the hang of this - I swear I'm always cutting exactly evenly, but it never seems to turn out that way). Shape the pieces (I made batards) and place them on a floured peel or parchment paper on the back of a sheet pan and let them proof for about 1 1/4 to 1 1/2 hours. About 45 minutes before baking, preheat the oven (and your baking stone if you have one) to 450 degrees. The loaves will noticeably swell. Slash them, spritz them with water and put them onto your baking stone. After 30 seconds open the oven and spray the walls, the back of the oven, and the loaves. Be careful not to get any water on the oven glass, as it will shatter (I found this out the hard way and it cost me over $200). You can also put a pan of water on the bottom rack of the oven to create more steam. I used to preheat the oven with the pan inside and throw the water into the pan to create a burst of steam, but this is how I shattered my oven door, so now I heat the water in the pan on the stove top until just about to boil, then I place the pan into the oven. It doesn't create that burst of steam, but it keeps the oven environment a little more humid during the first few minutes of baking which helps promote good crust development. Rotate the loaves after 15 minutes and continue to bake another 10 minutes. The internal temperature of the bread should be 205 to 210 degrees and the bread should be nicely browned. If the bread is browning too quickly, try turning down the oven temperature. Cool the bread completely on a rack. Once the bread has cooled, slice and enjoy! This bread is fabulous, with a crisp, chewy crust and a terrific crumb. So my second batch of rustic bread has long since come out of the oven, cooled, and been eaten (one loaf at least), and I think I can safely say that this recipe is a total winner. The bread was just as delicious as the first time, and baked up beautifully as well. I made 3 smaller loaves instead of 2 larger ones, which would have been fine had I not tried to proof them all on one peel and bake them at the same time. There wasn't quite enough room in my oven to maneuver and the loaves ended up touching each other for the first few minutes of baking until the were set enough that I could open the oven door and separate them with my bench scraper. 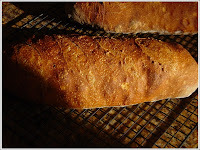 The end result was pretty much cosmetic only, as some of the crust on the sides of the bread did not properly brown. The loaves also may have been a little higher if I hadn't had to handle them so much on the peel before putting them in the oven (they were a little too close for comfort after proofing and I tried to slide them apart with limited success). I'll make this one again the next 2 weekends just to be sure, but I think this is going to become my first "go to" bread when I need something extra special to put on the table. Now that I had some great bread, I needed a meal to go with it. 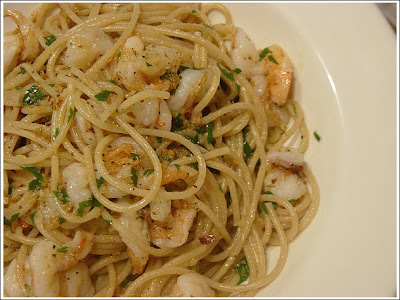 I had a few leftover shrimp in the freezer, so I made a modified scampi style dish. Lots of olive oil, garlic, and crushed red pepper over whole wheat sphaghetti. 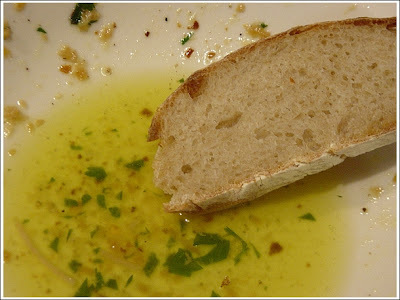 When I finished my bowlful there was all this garlicky, peppery oil left in at the bottom. The rustic bread performed admirably. If you're interested in baking bread, but never have before, it might be best to read through this excellent tutorial before attempting this recipe. Mix the starter into the dough by kneading. If using a mixer, mix with the dough hook on the suggested speed for 5 minutes (I knead on 2 in my Kitchen Aid). If kneading by hand, knead for about 10 minutes. Try keeping your hands wet so the dough doesn't stick, this will also offset any flour you may add while kneading. 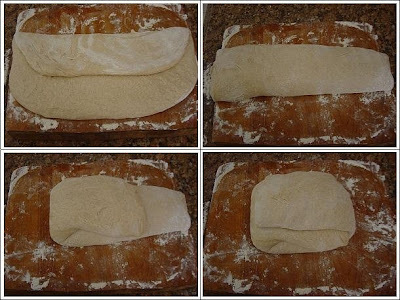 After 1 hour, empty the dough onto a floured surface, gently spread it into a rectangle and fold it in thirds like a letter then rotate the dough 90 degrees and fold again, place the dough back in the bowl. Repeat this process after 2 hours of fermentation. After the dough has fermented, divide it into 2 equal pieces, shape them into either boules or batards, and place them on a floured peel or an upside down baking sheet with parchment paper and cover them with a towel. Slash the loaves, spray them with water, and put them into the oven (either directly onto the stone or bake them on the back of an inverted baking sheet). Use whatever method you prefer for creating steam. I suggest placing an oven-safe pan (like cast iron) with about 1 cup of simmering water on the bottom rack of the oven below your stone. 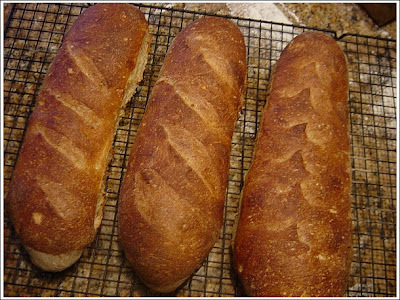 After 30 seconds, open the oven and spray the oven walls, back of the oven, and the loaves themselves with water. Repeat this 2 more times in 30 second intervals. Allow the bread to bake for 15 minutes then rotate the loaves. Bake 10 additional minutes (watch the bread at this point to make sure it's not browning too quickly) and check the temperature of the bread, it should be over 200 degrees, ideally 205 to 210. If the loaves are brown but have not reached an ideal internal temperature, lower your oven temperature and try to continue baking (if you think they're about to burn, then remove them). The total baking time for this bread can be anywhere from 20 to 35 minutes depending on the oven (In my oven the bread is almost done after 20 minutes). Allow the bread to cool completely on a rack. If you're going to save bread more than 1 day, wrap it in a double layer of plastic wrap upon cooling and freeze. To use, take bread out of the freezer a few hours before you wish to eat it. Just before eating, place unwrapped bread in a 350 degree oven for 10 minutes.